Large marine system, variety of pond fish and a varied selection of pond and aquarium plants all year around. Despite being one of our smaller stores, Ramsgate is packed with everything for the fishkeeper. We offer a wide selection of of freshwater fish, ranging from Neons and Guppys to Electric Blue Balloon Rams and Geophagus. We are proud of our expanded marine system, that's allowed us to offer an increased variety of both reef and non reef livestock. However if we don't have the fish you are looking for, our friendly staff will be more than happy to source it for you. Our pond area is definitely worth visiting, offering a variety of pond fish, from the common goldfish to Israel Koi and Rudd. Alongside our ponds, aquatic plants are one of our passions at Ramsgate and you will find a fantastic selection of pond and aquarium plants all year around. Our staff are all enthusiasts and will be only too pleased to show you all the latest gadgets and products on the market. With a wealth of experience, their fishkeeping advice is second to none. Whether you are new to the hobby or a seasoned aquarist, we'd love to see you, and don't forget to pop in and see our three Oscars; Rod, Jane and Freddie, they are real characters and popular amongst all of us here at Ramsgate! 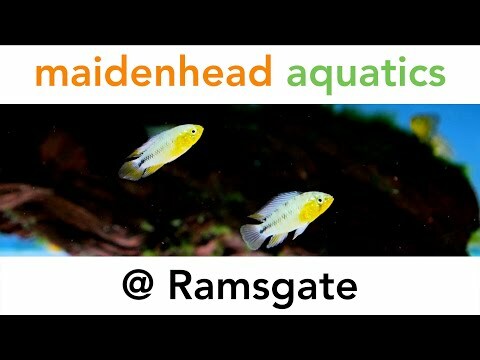 With all this as well as as some superb offers all year round, Maidenhead Aquatics at Ramsgate is a must for all fishkeepers.